What better way to kick off the 2017 and a new catalogue and Stampin' Up's best promotion of the year... Sale-a-bration? The new Spring/Summer catalogue is full of beautiful stamps, papers and embellishments and scores of inspirational projects to inspire you and this year's Sale-a-bration offering has got to be the best yet! If you haven't heard of Sale-a-bration before, you may be wondering what the fuss is about, so let me explain. Sale-a-bration runs from now until the 31st of March and there are three ways to earn FREE products! For each £45 you spend, you can choose a FREE item from the Sale-a-bration brochure. There are 12 items to choose from including stamps, paper and ribbon. So spend £45 and pick one item, spend £90 and pick two, spend £150 and you also qualify for Stampin' Rewards as well! Host a party with me or share the catalogue with your friends and gather together at least £200 of orders and earn an extra £20 of Stampin' Rewards. You will receive at least 10% of the order total plus the extra £20 which means at least £40 of FREE product as well as FREE Sale-a-bration items as well!! Sale-a-bration is the perfect time to join Stampin' Up! For only £99 you can choose £130 of products plus two free stamp sets of any value! Which means you could be earning over £100 in FREE products! 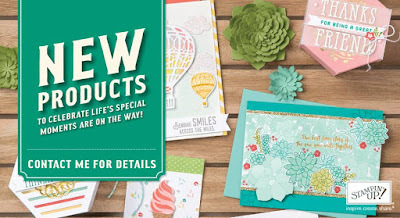 There is more information about joining my team and Stampin' Up in the tabs above and I would love to hear from you, if you have any questions. There is a link to the catalogue in the sidebar or you can go straight to my Online Shop by clicking the tab below. Don't forget to use the Hostess Code when ordering and receive a thank you gift from me.